Seoul insists it will not renegotiate the deployment of the US's THAAD missile system following President Trump's suggestion last week that South Korea should reimburse Washington $1 billion for the system. Speaking to Sputnik, South Korean military expert Kim Dongyeop said Seoul should have prepared for this eventuality a long time ago. Last week, Trump told Reuters that he wanted Seoul to pay for the $1 billion defense system, ostensibly stationed in the country to shield it against possible missile attack by North Korea. A few days later, amid urgent insistence by South Korean political and military officials that they would not pay, Trump National Security Adviser Herbert McMaster further muddied the waters, contradicting the president and stressing that Washington should pay for the deployment. But officials in Seoul remain adamant, stressing that South Korea would not renegotiate the original arrangements with the US on THAAD (Terminal High Altitude Area Defense), installed in the south of the country last week despite strong objections from local residents, and from Russia and China, who believe the system is aimed against themselves. Originally, under arrangements made with the Obama administration, South Korea was to provide the US with the site for THAAD, consisting of a golf course in Seongju County, with the US agreeing to bear the costs of the system and it operation. Local analysts say the US is trying to use THAAD as lever of influence to demand an increase in the South Korean side's share in the US-South Korean joint defense agreement. However, unlike Japan, which regularly publishes detailed information on how much each side spends, the South Korean government's data is deliberately incomplete, making it difficult to determine whether THAAD will be reflected in Seoul's overall spending commitments. In this photo provided by U.S. 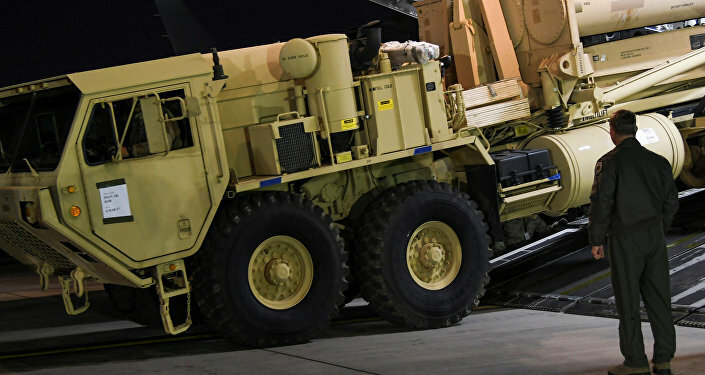 Forces Korea, trucks carrying U.S. missile launchers and other equipment needed to set up the Terminal High Altitude Area Defense (THAAD) missile defense system arrive at the Osan air base in Pyeongtaek, South Korea, Monday, March 6, 2017. 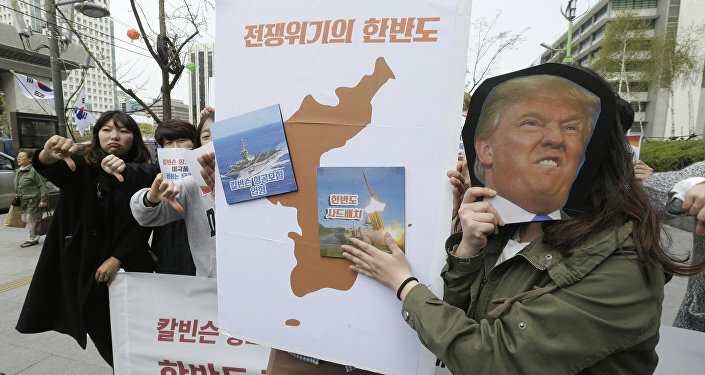 Speaking to Sputnik, Kim Dongyeop, a professor at the Institute for Far Eastern Studies at South Korea's Kyungnam University, explained that the US may simply appropriate unspent joint defense funds that have been accumulating since 2014. "The unused funds for joint defense spending accumulated under the three main articles [of the joint defense agreement] amounts to 950 billion won, or about $840 million US, and it will most likely be used to build the facilities needed to accommodate THAAD in Seongju," Kim explained. Perhaps more importantly, the expert noted that Seoul should have expected this kind of thing from President Trump long before the scandal over the THAAD deployment. 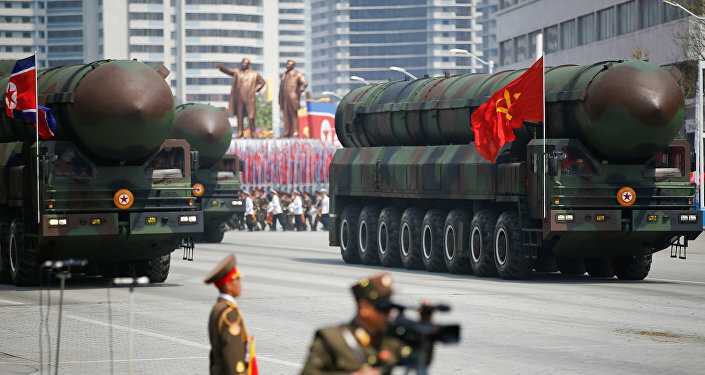 "It was long expected that the US would begin demanding more South Korean spending for joint defense, or to put pressure on it to purchase US armaments, which in turn would require an increase in South Korea's military budget." In this regard, Kim warned that even if the $840 million may temporarily cover the expenses for THAAD in the first stage of its deployment, further spending on the system's upkeep are almost guaranteed. Ultimately, citing recently voiced ideas that Seoul might buy THAAD for itself and take total control of the system to show China and Russia that it is not aimed against them, Kim stressed that this too would be a bad idea. "In a situation where the effectiveness of THAAD against North Korean missiles is yet to be confirmed, calls to 'buy and use THAAD independently' seem to me to be dangerous," the expert concluded.